Your query contained the elements of a rewarding investigation, David: microwaves, pizza, food poisoning, death, and—this was a deft touch—the eating of sizzling bacteria. I sent word to the lab: Break out the petri dishes. Before we start, three critical questions: First, can bacteria really just land on your food while it’s sitting on the table? Second, what’s the best way to kill bacteria? Third, is a microwave a suitable tool for bactericide? The first question is easy. Yes, bacteria not only are found on floors, tabletops, and other surfaces, they drift around in the air, too. Scientists collecting air samples for 17 weeks in San Antonio and Austin, Texas, recently found 1,800 types of airborne bacteria. Among them were cousins of Francisella tularensis, sometimes mentioned as a potential bioterror weapon. OK, Texas is known for its abundant lower life forms; still, this is something to keep in mind if food-storage procedures at your house are a bit casual. Next question: killing bacteria. Alcohol will do the trick, which may lead pizza lovers to think: problem solved. Unfortunately, the alcohol concentration needed to kill bacteria will go a long way toward killing you. Sealing bacteria off from oxygen will suppress some, but anaerobic bacteria can do fine without. The best method is heat. Milk, for example, is pasteurized by heating it to about 162 degrees Fahrenheit for 15 seconds. But even that’s not a sure thing—some bacteria thrive at temperatures up to 167 degrees, and certain bacterial spores, such as Clostridium botulinum (responsible for the deadly botulism toxin), can survive for hours at 212 degrees. Will a microwave kill microbes? Sure. Microwave ovens use electromagnetic radiation to heat water molecules in food. It’s the heat, not the microwaves, that’s lethal here; the hotter you make your food, the more likely you are to kill the bacteria in it. (Some contend microwave energy itself is fatal to bacteria, but that’s unproven.) The key is making it hot enough uniformly enough for long enough. If the food heats unevenly, a common problem in microwaves, some bacteria may survive. 1. They assembled 30 petri dishes containing agar gel (a bacteria nutrient), plus an impressive collection of graduated cylinders and other lab equipment. 2. One Pizza Hut Meat Lover’s Pizza (Fierra’s favorite) was ordered. Upon delivery three swabs were taken of the pizza and applied to three petri dishes. Additional samples of pizza were diluted with distilled water, in ratios of 1:10 and 1:100, and applied to two more pairs of dishes-making seven dishes in all—just in case the pure pizza swabs gave rise to such swarming masses of microbes that we couldn’t count the colonies individually. 3. The pizza was allowed to sit in the open air for four hours. Then three more swabs of full-strength pizza were applied to petri dishes, as were two each of the 1:10 and 1:100 dilutions, for a total of seven more swabbed dishes. 4. 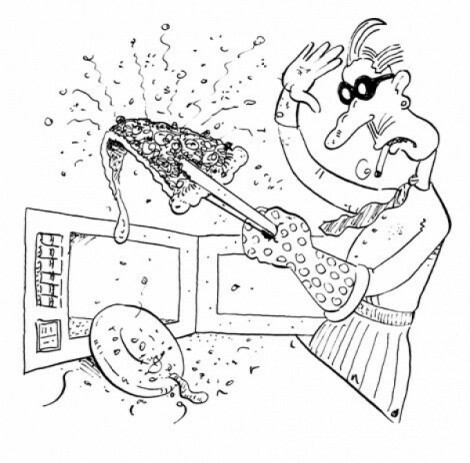 The pizza was microwaved in a 1,000-watt oven for 30 seconds on the highest setting. Another seven dishes. 5. The pizza was microwaved on high for 30 additional seconds. More dishes. 6. Control swabs were taken from distilled water; another control dish was exposed briefly to the air. • The undiluted samples taken from the freshly delivered pie generated 11 bacterial colonies. (Nothing doing in the diluted samples.) We’ll take that as our baseline for normal, generally harmless bacterial infestation. • The full-strength samples taken after the pizza had been sitting out for four hours generated 28 bacterial colonies; two more showed up at the 1:10 dilution. Probably all were harmless, but I figure triple the bugs—triple the risk. • The samples taken after 30 seconds of microwaving produced 17 bacterial colonies; the 60-second samples produced only three. The diluted and control samples produced nada. Conclusions: 1. Heating the pizza for 30 seconds was relatively ineffectual. 2. Heating it for a full minute killed most of the bacteria but not all. Having exhausted the science budget, we didn’t go in for another round of testing, but we suspect that at least two minutes of microwaving would be needed to ensure 100 percent bacteria eradication, at the possible cost of rendering the pizza inedible. 3. Fresh pizza has its share of microbes, most undoubtedly benign—still, you never know. Care to join me for a light supper of guaranteed-sterile agar gel?